You might think the ceremony would be the most nerve racking part of the wedding day, but once the groom has got that out of the way he still needs to stand up at the reception and make a speech! 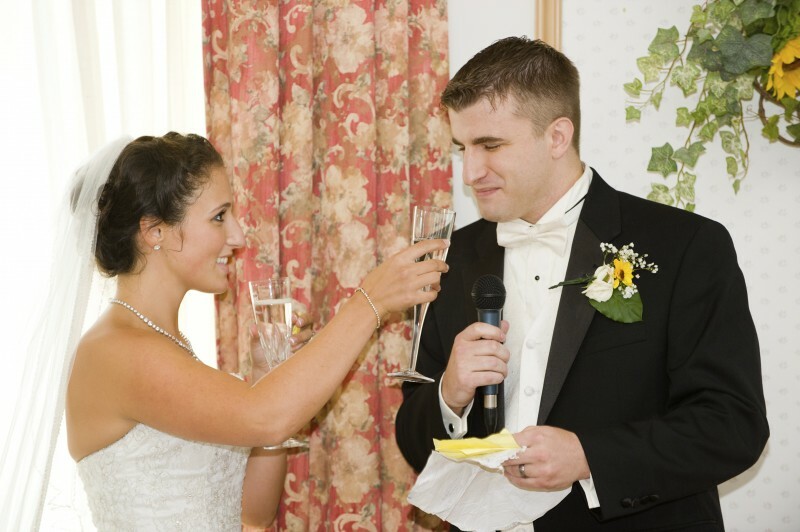 Here are a few tips on giving a great grooms speech. The groom’s speech is expected to be serious and heartfelt so humour isn’t mandatory. The groom should never make jokes involving the bride or include smutty asides that won’t go down well with some of the guests. If the groom is a naturally funny public speaker, it is acceptable to add a little humour into the speech, but otherwise this should really be left to the best man. Grooms should commence their speech by thanking their guests for coming. They should also thank everybody involved in planning the big day including parents, the bridal party, and anyone that has made a contribution such as making the dress or putting up decorations. Some brides and grooms now choose to make a joint speech but if this isn’t the case the groom should remember to ask his wife if she wants to thank any specific individuals as he is speaking on her behalf too. The groom should practise the speech enough times so he is sure to get it right. However, if he does stumble over a line it doesn’t matter; the guests really won’t hold it against him. He should limit the alcohol he drinks before the speech. The slurring, rambling, and swearing that usually accompanies tipsiness probably won’t warm the hearts of the bride’s relatives. The groom should thank the father of the bride for allowing him to marry his wonderful daughter. This is a great opportunity to tell the bride how beautiful she looks. If the father of the bride has just finished his speech, the groom should thank him for his words of wisdom, especially if kind words were directed at him. The essential part of a groom’s speech is the bit where he talks about his love for his new wife. He should use certain anecdotes, such as the moment he knew he was in love and would spend his life with her. He should address this part of the speech directly to her and say how he feels extremely lucky to have her, how happy she has made him, and how he is looking forward to building a future life together. Finally he should tell her (again) how gorgeous she looks. The groom’s speech is an ideal time to give gifts to the bridal party as a mark of appreciation for all the hard work they have put in. Make sure the gifts are properly labelled so the groom doesn’t give cigars to the bride’s mother and diamonds to the best man. Ideally the groom should have someone to help them with this so they don’t have to exit the room in the middle of their speech to gather the presents. Usually the groom’s speech finishes with a toast to his new wife. After all, she is leading lady in the wedding. By now the groom should realise that once again he has a perfect opportunity to tell the bride how pretty she looks. It’s safer to mention it five or six times during his speech than forget to mention it completely! !